Following on the heels of the well received Liberalism: A Primer comes the first translated copy in the much awaited local language series. 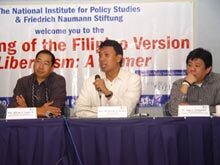 The National Institute for Policy Studies (NIPS) together with the Friedrich Naumann Foundation (FNF) launched the Filipino version of the primer on August 30 at the Imperial Suites hotel, Quezon City. NIPS emphasized that with Liberalismo: Isang Praymer the values of liberalism can reach a wider audience in the main island of Luzon. “In these crucial times, the primer will serve as a guide in our fight for democracy,” said Dr. July Teehankee, NIPS managing trustee. Especially in the grassroots level the primer can help in building, consolidating and strengthening the Liberal Party (LP). “Liberalismo: Isang Praymer will help our members and potential members better understand our political ideology, and every member can better contribute to making LP the party of the future," said Rep. Alfonso Umali Jr., LP deputy secretary general. "Bawat pag-anib sa partido ay isang kasaysayan (each member becomes a part of history),” he added. “This is another cause for celebration for NIPS and LP. The Foundation will always be supportive of projects such as this. Ang pagsasalin ng praymer sa Filipino ay isang malaking hakbang sa pagpapalaganap ng liberalismo (the translation of the primer in Filipino is a big step in spreading liberalism),” said FNF Senior Administrative Officer Minnie Salao.